stunning miniature scenes. Here is the link to Limor's web site Limor. is Limor's mother. 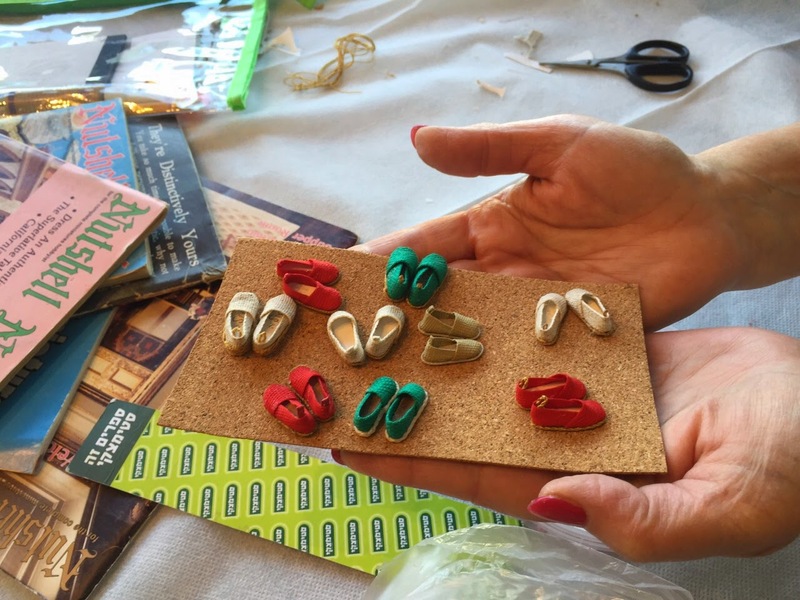 Both mother and daughter are very talented miniaturists. some of their work after each time we meet. This time we each made a pair of espadrilles. out. I have to wait until the clay is completely dry then rub the surface smooth, glaze and fire. You gift is very nice! I would love to be able to make those shoes! I am glad you are enjoying your group! Que maravillosa reunión!!! Y ademas recibiste la cesta de embutidos preciosa y perfecta!! Las alpargatas quedaron geniales!!! 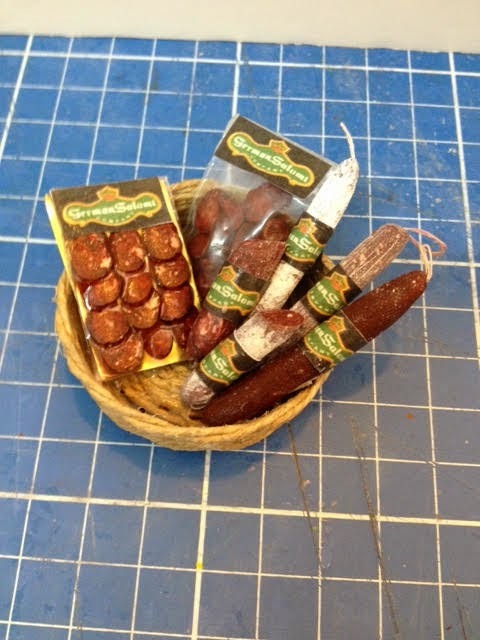 Saucisse et chorizo sont très réalistes!vous faites de bien belles miniatures pendant vos rencontres ! Je ne vois pas le lien pour M Limor. How lucky you are to connect with a group of people with the same hobby and learn and make together the most wonderful miniatures :D! These sausages are so life-like and looks delicious! The small espadrilles are amazing work. 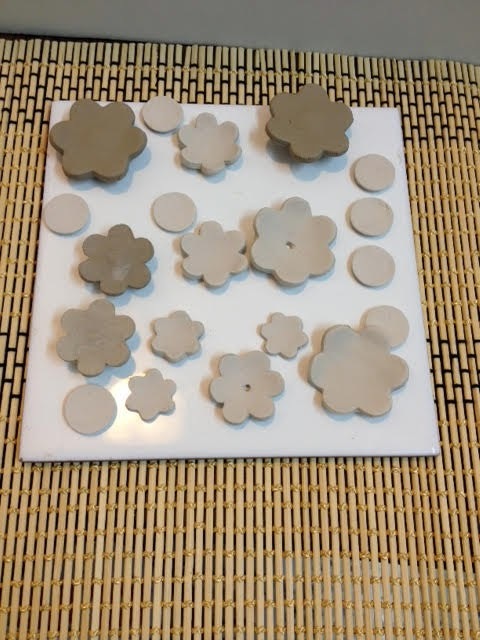 I love the plates you've made, can't wait to see how they will be :D! Esos embutidos parecen de verdad!! No doubt, you're really enjoying a good time togehter at your miniaturist's meetings... and the espadrilles you made look stunning. This basket full of meat is one gift for sure - they look absolutely real! And I'm really looking forward to getting to know your fellow miniacs - and even more to seeing your finished plates. I am happy you are getting time to spend with other miniaturist friends! I wish we had something avaialble here. The basket of meats is wonderful and the shoes are fabulous Oh adding ceramics to your skills I cannot wait to see your beautiful flowers inside some beautiful homade vases! Incontrare amici che hanno la nostra stessa passione è bellissimo, sono molto felice per te! Il cesto che ti hanno regalato è bellissimo, complimenti all'autrice! It's fun to meet miniaturists friends. The basket is amazing and the shoes are very beautiful. es ist so schön sich mit anderen Gleichgesinnten auszutauschen, man sieht das ihr eine menge Spaß hattet die Schuhe sind Klasse. What a talented group. I look forward to seeing their work and I also am looking forward to seeing your dishes. What cute Espadrilles!!!! And The mini you got from the swap is as realistic as it could be!! You said you are waiting for the clay to dry before sanding, glaze and fire....fire in a kiln? Or fire in the oven? Wow the basket of meat looks fantastic and so real. I love the shoes. It looks like you are having fun at your meeting. I wish there was such a group here. I cant wait to see your dishes finished.